Each year, around now, I plan to spray my four small apple trees and indulge my optimistic vision of harvesting apples that are beautiful, tasty and—most of all—free of worms. 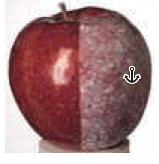 The worms that ruin these great apples annually are the larvae of the codling moth (Cydia pomonella). My usual plan of attack has been to spray the tree three times with horticultural oil, before it sets buds, to smother insects as they hatch. I have never accomplished this task in a timely and thorough manner, and never had satisfactory results. This year, I learned that horticultural oil treatment can eliminate aphids, but has no impact on codling moths or other pests that attack the fruit. A fruitless strategy! I mentioned my concern this week to a member of the California Rare Fruit Growers, who said he has a detailed regimen for treating the soil around his trees, has never sprayed and has no pest problems. At the moment, I couldn’t write down his method and it seemed like a long-term process anyway, so I researched the issue. Valuable advice is available from Michael Phillips’ highly regarded book, The Apple Grower: A Guide for the Organic Orchardist (2nd edition, 2005). He advocates treating the soil to promote the development of fungi that help trees to deal with pests and diseases. This might be the method practiced by my CNGF contact. Apple farmers use two effective new organic products: Surround, a spray that coats apples with insect-repelling kaolin clay, and Entrust, based on Spinosad, a poison that is derived from naturally occurring bacterium. These products are sold in commercial quantities for licensed users. Spinosad is also available in smaller quantities for usage by unlicensed home gardeners, in Captain Jack’s Dead Bug Brew, Green Light Lawn & Garden Spray with Spinosad 2, Monterey Garden Insect Spray and other products. Entrust, a Spinosad product, is available only in larger quantities for commercial fruit growers. Here is an example of one such product, Entrust. $599.00 This product qualifies for $9.99 flat rate shipping in the Continental US. This is a special order item. Please call 888-784-1722 to place an order. Spinosad insecticides are nerve and stomach poison derived via fermentation from naturally occurring bacterium Saccharopolyspora spinosa. 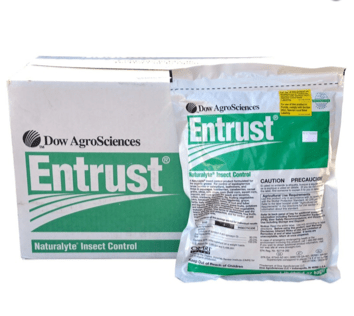 New chemistry represents an alternative to Bt for worm control and offers excellent control of targeted pests and low toxicity to non-target organisms, including most beneficial insects. Low mammalian toxicity, helps conserve beneficial insects. Dry formulation of spinosad labeled for cole crops, corn, cucurbits, fruiting and leafy vegetables, pome fruits, potatoes, stone fruits, strawberries, bushberries and cranberries. Controls caterpillars, certain beetles, thrips and leafminers, including many pests prone to resistance problems such as diamondback moth, cabbage looper, fall armyworm and Colorado potato beetle. For Colorado potato beetle, use only every other year to help prevent resistance. Apply .5 – 2 oz per acre. Note: At the recommended application rate, one pound of Entrust would be enough for on treatment for between eight and thirty-two acres of crops. Other information sources indicate that multiple treatments may be required, because the coating can be rubbed or washed off easily. $37.50/25 lb. bag at Planet Natural. Made from modified kaolin clay, Surround WP Crop Protectant is sprayed on as a liquid, which evaporates leaving a protective powdery film on the surfaces of leaves, stems and fruit. Controls a long list of insect pests on vegetables, fruit trees, ornamental plants s and more. OMRI Listed for use in organic production. Tiny particles of the kaolin clay attach to insects when they contact it, agitating and repelling them. The protective white film cools plants by up to 15° Fahrenheit, which can help to reduce heat and water stress. Many fruits show improved color, smoothness and size with less russet, dropping, sunburn and cracking. that needs to be covered. Mix 1/4 to 1/2 lb. per gallon of water (25 to 50 lb. per 100 gallons of water per acre). May be applied up to the day of harvest. Description Surround W. P. is made from 95% kaolin clay, a naturally occurring mineral. When applied to fruit trees, crops, and other plants, it forms a white film. Surround suppresses a wide range of pests, especially those that damage fruit crops including pears, apples, grapes, berries, and some vegetables. It can be applied up to day of harvest and is easily rubbed off when the fruit or produce is ready to eat. Surround can help control pests such as: pear psylla, cutworms, pear midge, pear slug, apple sucker, climbing cutworm, eastern tent caterpillar, gypsy moth, Japanese beetle, June beetle, grasshoppers, green fruit worm, leafrollers, lygus bug, Mormon cricket, cicada, stink bug, tarnished plant bug, thrips, fabria leafspot, apple maggot, codling moth, plum curculio, rose chafer, aphids, naval orangeworm, husk fly, blueberry maggot, blackberry psyllid, flea beetles, orchards, grape leaf skeletonizer, bean leaf beetle, Mexican bean beetle, powdery mildew, cucumber beetle, boll weevil, armyworm, black vine weevil, and fruit flies. How it works Insects are repelled by Surround. It sticks to their body parts and encourages them to move on elsewhere. At harvest time, the white film can be removed simply by rubbing off. General usage: Use in orchards, fields, vegetable gardens. Add the powder slowly to approximately 1/4 of the water you will be using, stir and mix well by shaking vigorously for 30 seconds. Add the remaining water and shake for an additional 30 seconds. Shake the sprayer occasionally during application. When finished, spray until the sprayer is empty and flush the system. Leftover mix can be used within 2 weeks to avoid spoilage. Rinse the sprayer before the next batch. Advisories Do not apply directly to water, or to areas where surface water is present or to intertidal areas below mean high water mark. Application rates General rate varies between 25 – 50 pounds per 100 gallons of water. Amount of water used will depend on amount of foliage to be treated. This entry was posted in Essays 2013, Fall Quarter and tagged Edible Plants, Fruit Trees, IPM, organic, Pests by tomkarwin. Bookmark the permalink.